So I figured it was time to post something green on this site again. Buy things fresh, not pre-packaged whenever possible and use cloth bags instead of the plastic ones for produce here is what I use but there are lots of options out there. 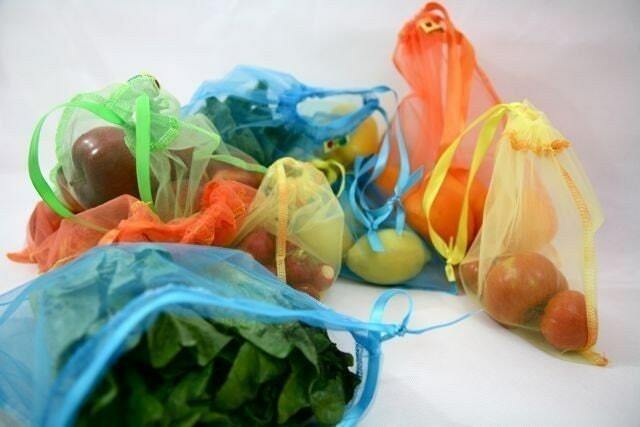 I found these on Etsy just type in produce bags you will get lots of options in sizes, color and price. If you use plastic bags cool, thats fine its up to you but can you reuses them? Doggie poo bags, trash can liners, liter box liners, recycle them at Wal-Mart, crochet them into rugs (just google it,) give to your local food pantry. Many people recycle the basics but have you ever payed attention to how many things can be recycled? For example yogurt cups, rinse and recycle. When I buy spinach at the store if I can’t find it fresh (reduce) then I buy it in bulk in a plastic tub that can be recycled!!! Magazines can now be recycled along with the glossy ads in the newspaper!! !